Is Evolution really settled science? Nathan Jones: What about those Evolutionists who say that Evolution is proven, scientific fact? They'll add that there is just no disputing Evolution because it has already been proven. How do you respond? Carl Gallups: Here's how I respond. No matter how loudly the ardent, fulminating, Evolutionist screams that Evolution is a settled science, it is not. I have dedicated several chapters in my book to irrefutably proving that. Think of this guys, Evolution is man's best answer to how we got here, if you leave God out of the picture. It's the best answer in thousands of years of human history that Man has been able to come up with. Think about that, because I want you to keep that in mind because when I start tearing it apart, you will see how utterly horrible that truth is. Evolution is Man's best answer, which they've couched and wrapped it in this shell of a lie that declares it is settled scientific fact. In response, what I say to that is, "Really? It is settled science?" Evolution is indeed a fascinating speculation, if there is no God, but of course I know there is. If there's no God, then we had to get here somehow, because here we are. Evolution is a "fascinating" speculation. So then, let's speculate. Could it be that out of a magical sludge pond, with a magical bolt of lightning, over magical billions of years ago, magically the first living thing came about out of nothing? That certainly is interesting speculation, which takes a lot of faith, but it's not settled science. As a matter of fact, I give many illustrations on how Evolution is not settled science fundamentally and how foundationally the Evolutionary proposition is flawed. Nathan Jones: What's an example? I would be curious to know. Carl Gallups: The best example I think is the example of going all the way back to the origins, which I just kind of touched on. I give quote after quote in my book, and I give the references of modern day, well respected scientists in Evolution. These are people who have written books and textbook who will say something like, "Abiogenesis is the best scientific answer for how we got here." Now, I've got them quoted. Nathan Jones: Abiogenesis is just Spontaneous Generations, right? It's a medieval thought, like observing flies swarming around fruit and believing that the flies evolved directly from that piece of fruit. Carl Gallups: Right, Abiogenesis is superstition. Aristotle brought it up 2,000 years ago up to about 200 years ago through the works of Louis Pasteur, for he was building on the works of others. They proved that it is absolutely scientifically impossible for life to arise from non-life, accidentally or otherwise. Even with all the intelligent input from scientists, we've not been able to create life from non-life. Not only is it impossible, but it is pure superstition. And yet, that ridiculous concept is the very basis for the origins and Evolutionary proposition today. The foundation of Evolution is flawed from the very beginning. To say that the way life all started was from non-living material, and I'm going to use this word because they won't and I play it up here, and "magically" became living material without any intelligent input, is an insane notion. The Evolutionist will counter by saying, "Your Bible says that God brought life from the dust of the earth." Yes, that's true, but that was with intelligent, supernatural input. Dr. Reagan: So, what you're saying is that the people who truly believe in magic are those who have the scientific view? 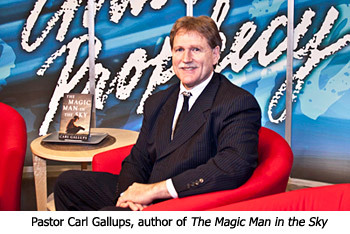 Carl Gallups: Those that say that Evolution is settled science are the ones who believe in magic. In fact, they're clinging to nothing more than ancient superstition. In the eleventh and last segment of our interview with Pastor Carl Gallups concerning the existence of God, he'll tell us what the ultimate question is, and then answer it. The amount of misunderstandings of science and fallacies in this article are deplorable. It is clear that neither person is educated in science or the Theories they are discussing. Abiogeneis (how life began) and Evolution (how life changes over time) are not synonymous. By using words like "magical" lighting and mud puddle may help make you argument but they are not what the Theories say. At no point was their an honest evaluation of the evidence the Theories are based on or the science behind them. People are so scared about evidence and truth going against their faith. It is very sad. What ever happened to the idea of Truth cannot contradict Truth? The real threat is the threat to the religion of Evolution and it's anti-God hatred by the facts which back up Creation and a Creator. Instead of railing against the facts, Anonymous, you should respond honestly about what to do with them and the responsibility we all as God's creations have to the Creator. Again you show your ignorance of science and scientific theories. Evolution says nothing about a creator or creation one way or anoth. It is a theory that explains how living things have changed over time. It explains why we (all creatures) are united on the fabric of life. Why we all share similar features and makeup. Why every living thing is based on DNA and the matter that makes up this Universe. It's says nothing of a God one way or another. It says nothing of God any more so than the law of Gravity, the Laws of Thermodynamics or any other law of physics. Why do you assume that God could not have instituted Evolution by Natural Selection to create organisms and humans? Because a book written a long time ago by humans may be interpreted to not understand these facts back then? I am not rallying against facts (of which you have offered none). I believe in God and I believe I am being responsible by representing the truth of His creation and what His creation tells us about ourselves and our origins. Your God of the Gaps theology and anti science campaigns do nothing to praise Him or give glory to His creation. Instead you present him as an imperfect God who has museums full of his "mistakes" at design...if he created each kind individually, then all the museums are full of his mistaken attempts at creating species that went extinct. Instead I view him as a God who was so creative and intelligent that he created a process that continually creates new life and led to beings that could come to love and understand their own Creator and take an active part in the creative process. I don't claim to be a religious expert but I am a scientistst. I do not try to go out and speak on or against different theological concepts that I have not studied or completly understand. I wish more ministers and theologians would do the same with science. Looking at your writings and your background, it is clear you do not understand a lot of science and the Theory of Evolution that you have decided to attack. I suggest you honestly look at the evidence and the science behind the theory with an open mind and heart before attacking it. Don't attack it based on what some atheists do with it to support their own philosophical or religious belief. Todd says "Evolution says nothing about a creator or creation one way or anoth. It is a theory that explains how living things have changed over time. It explains why we (all creatures) are united on the fabric of life. Why we all share similar features and makeup. Why every living thing is based on DNA and the matter that makes up this Universe. It's says nothing of a God one way or another." To me, Todd, that says the you are guilty of your own accusation. YOU DENY the possibility that the explaination for similar features and makeup is due to the design of the Creator from the beginning of creation not requiring an evolution. I note you "believe in God" (is this the Father/Son/Holy Spirit or one of your "many paths to God" gods?). Do you believe in Jesus Christ? I can deny evolution because the Bible says quite clearly that creation was "good" and death did not exist until the fall of man. This WORD OF GOD FACT is INCOMPATIBLE with the MAN MADE THEORY of evolution. If you truly believe in the Word of God of the Holy Bible then you can NOT deny my previous paragraph. You need to rexamine your faith. Todd says "I do not try to go out and speak on or against different theological concepts that I have not studied or completly understand." That's all you did in your post! You CLEARLY don't understand the Word of God yet you attack what you don't understand. Hail the scientific mind! ROFL!!! I need to start proofreading! Todd said "Instead I view him as a God who..."
That's says it all. Todd's God has been created in Todd's image. For Bible believing Christians, God is defined by the Word. I have a hard time following your statements. Could you point out how I deny that the similar features of organisms is due to design by God? I said exactly the opposite when I stated my belief that God created and/or designed Evolution by Natural Selection. I am confused. I think you are trying to twist my words so you can argue against me. Also, where in my post did I attack or argue against the Word of God? Or create God in my image? Do you not believe you can come to know God through Faith and Reason? Do you not believe you can come to know him through what you see in this world (His Creation)? Or do you pick and chose what is convenient to your biases and interpretations of Scripture? But that is besides the point. You did not address any of my questions or concerns concerning the lack of understanding of what a Evlutionary Theory actually says and instead decided to attack me and told me I need to reexamine my Faith and that I have created my own God...very Christian like. If you are not interested in "Man-Made theories" that is fine, then don't preach against them if you don't even understand them. My goal was simply to create a dialogue and to ask those who have not studied the Theory to actually study it before deciding it goes against the Word of God. It would be like an atheist saying Cristianity is evil and immoral without understanding or studying the doctrine (The Bible) and traditions involved. It seems you are not interested in that dialogue or actually learning about what you so adamantly deny and hate. I was simply trying to make the point that with a little education, you isn't find that the things we discover in science actually do not threaten your Faith but could strengthen it and help you come to a more fuller understanding g of creation. Before denouncing the koran I actually skimmed through it and found verses that deny Jesus is the Son of God and that he died and was resurrected. So I agree you should know SOME, not EVERYTHING about something to comment on it. Evolution has been spewed out of the sewers of the scientific community into the schools where we had to learn about it (from a secular perspective). And I have watched some DVDs (from a Christian perspective) about evolution, too. So I feel I know enough to comment. You said "I have a hard time following your statements." Actually, I agree with that. So do I. I was typing so fast my fingers weren't keeping up with my thoughts (hence my "I need to proofread" post). So I'm to blame for your misunderstand of my poorly constructed comments. So, let me just go back to some of my main problems with evoltion and leave it at that. 1. My beliefs are based on my understanding of what the Word of God says PERIOD. It is not based on (to me) whether the limited and laughable scienctific knowledge of man is able to mesh and support the Word of God which I accept in childlike faith. No science can explain the resurrection of Jesus so science is not a factor in my belief. 2. The Word of God says creation was GOOD. Evolution, which is the survival of the fittest which involves killing and death is NOT good. So a GOOD Creation without DEATH is NOT consistant with the theory of evolution. These two points alone are enough for me to reject evolution. I apologize for my earlier post that were "fuzzy". On the other hand, you said "My goal was simply to create a dialogue..."
"...you show your ignorance..." You called us ignorant. "Because a book written a long time ago by humans may be interpreted to not understand these facts back then?" You call a book which Christians believe to be the divinely inspired and the Word of God to be "written...by humans". Perhaps an unintentional slight by you to Christians. You said "I do not try to go out and speak on or against different theological concepts that I have not studied or completly understand." A false assumption on your part as I previously stated. "I suggest you honestly look at the evidence..." This implies L&L is being dishonest. It is because of such statements that I went of the defensive. Had you left them out I likely wouldn't have made similar comments. Thanks for your reply and God bless. I am curious about the type of language you use in your posts, such as "out of the sewers of the scientific community" and "laughable scientific evidence." Are these words inspired by God? Is that an honest assessment of science? So because you have gone to public school and have watched a few DVD's you know about Evolution? Or because the Koran rejects the Divinity of Christ you reject all or any truth the Koran could offer? To me that is laughable. I am sorry if I came across as describing this site as maliciously dishonest, I do not believe that they are being dishonest necessarily on purpose. But I do believe that they and you are misrepresenting science and scientific theories. And whether it is out of malice are misunderstanding or fear or ignorance, it is still not an honest account of the theories. I don't think we are even on the same wavelength as far as an argument continuing. I simply cannot follow the logic you offer for why you are anti-evolution. Based on your logic, God must not have created anything living on Earth since it all eventually dies. Evolution cannot be labeled "Good" or "Bad." It explains how things change over time. It explains things we see around us. It explains how you can get from a Grey Wolf to a Chihuahua or a Great Dane. It explains why we need a new flu shot each year. It explains why we can develop treatments and drugs for humans by learning and testing lower organisms. It says nothing of whether creation is good or bad. The biggest thing you have going for your argument is a fiction. It is the assumption that Evolution goes against your Faith or that it cannot be reconciled with it. But I digress, my point is not to question your Faith, if it helps you to live your life by following Christ's message (which has nothing to do with discrediting science or scientific theories to my knowledge), then I think that is awesome. Though the use of some of you language seems spiteful and hateful, which I do not understand. My point, and I think you have helped me make it, is that there seems to be a lack of understanding and distrust in Science and one of its basic Theories on this site. It seems to me that you all do not understand the science or theories you are attacking and are instead presenting a "Religion of Evolution" or philosophy instead of what the theory actually is. Your words and the words on this original article show a general misunderstanding of what the theory is and that disappoints me. Again, it has nothing to do with determining the existence or nonexistence of God. Instead of helping people come to a mutual understanding and learning more about God's awesome creation, this type of language promotes polarization, hatred, and misunderstanding. I think that is sad and that is why I decided to respond to this post. Again, I applaud your passion to follow Christ and his teachings and hope that one day all Christians can come to accept that science and theories like Evolution are not the enemy, but they can instead help us to a better understanding of ourselves and the rest of God's creation. Todd said "you assumed I am not a Christian (which is not true)"
Since you say you are Christian you should not be willing to have anything good to say about the koran. To say the koran is worth in any way is an insult to Christians, for it denies the most basic and cherished beliefs of Christians. How odd. Todd said "Is that an honest assessment of science?" Here is my honest assessment of science: Science is great. It has provided us with medical advances and improved the lives of all through inventions. Science is awful. It produced nuclear bombs. Science is in the sewer. That is when it is used to try to deny the Word of God (such as with evolution). Like most things (including people), science is both good and evil. That is my honest assessment. Todd said "So because you have gone to public school and have watched a few DVD's you know about Evolution?" Absolutely!!! You don't have to be a master chef to judge food. You don't have to be a master mechanic to judge a car. Therefore, you don't have to be a scientist to judge evolution. Todd said "Based on your logic, God must not have created anything living on Earth since it all eventually dies." Actually, nothing died until the fall of man. It is your inability to understand the Creation as told by the Word of God that is blinding you. Todd said "If you believe that it was written by Humans inspired by God, how do you know they may not have made errors or not have had all the info at the time? You and I are humans inspired by God, yet we make errors as well..."
I don't know of any Christian that would say the Word of God can be in error. Another odd thing to come from a Christian. Todd said "My point, and I think you have helped me make it, is that there seems to be a lack of understanding and distrust in Science and one of its basic Theories on this site." The key word is "theories". Note it is the "theory" of evolution. Well, there you go. You believe in the THEORY of evolution. I believe in the FACT of Creation. Which brings me to my last and final comment. Todd said "I don't think we are even on the same wavelength as far as an argument continuing." I do not see why you assume you can speak for "all Christians." I know many Christians who are open and value other opinions and common Truths and messages of other religions and scriptures, even the Koran. You don't have to accept all of something to admit that there is good in it. So you equate understanding complex ideas and theories to judging whether or not food tastes good? Really? So I just need to know about numbers to do Calculus? And you called science and some of my comments as laughable? And you would have to be a mechanic to judge whether a car is well designed or built and to know how to fix it. I am curious why or how you feel that you can judge my ability to understand the Word of God. By your logic you gave to argue against Science, I could do the same to you...I have read the Bible, therefore I understand enough to tell you that you are just plain wrong about it. I watched some DVDs too, some from a Christian perspective. I argue it is your inability to understand the Creation as told by the Word of God and as being told by Him right now as he is continually revealing his Creation with the data and evidence that is all around you. Again you show you misunderstanding of science with your use of the word Theory. Theory is the highest form of science that is backed by the most amount of collected evidence. I don't know what you mean by the Fact of creation...I believe in it too! If you do not want to be open to dialogue or have an open mind about an alternative view that might bring us to mutual understanding and respect, then just say it...at no point did you address the main idea I was presenting about the possibility that the Theory of Evolution may not be as you understand it and may actually enrich your Faith. You showed that you misunderstood it and resorted to attacking me and questioning my faith and my status as a Christian. I find that disappointing. Again you misunderstand Evolution and Science and misrepresent it. This leads to polarization and confusion and does not allow groups to come together and find mutual understanding and respect. But I guess you have already said you are not interested in that. It seems to me that you are more interested in judging others and other ways of thinking as anti-God and evl. I am disappointed about that since it gives us Christians a bad rap when those of us act that way. I think we've both made our points by now. Todd, because I start out with the first person account of how the universe is made - Genesis - I build my understanding of science based on that. Evolutionary understanding is based on no first person account, and outright ignores all evidence of a Creator. That's not science, that's religion. For information on why you can trust the Bible as God's infallible first person account, check out this article. Again, Evolution has nothing to do with a Creator and says nothing about one one way or another...it explains how creation is operating today and has since life was created...it doesn't ignore any evidence for a creator because it is not an explanation for creation! You can call it a religion all you want but that doesn't make it true and you are still misrepresenting the Theory and the science. For information on why you can trust Nature and creation, go out and look at it, study the animals, the humans around you. Look at the fossils in museums. Openly have discussions with other people that may not share your worldview. Learn about what evolution actually says rather than continuing to spit out the propaganda that paints evolution as anti-God or Creator. Todd, exploring nature is exactly my point. We're talking worldviews here (see past segments of this series). When one believes the Bible as God's first hand account, then we believe there is a Creator who made everything in six days. Every bit of science and nature I look at is filtered through that fact. It's the foundation of how I see life. When one does not believe the Bible's account, they turn to other theories of origins. Read the lives of the founders of the Evolutionary view. It came about when those people wanted to exclude the concept of a Creator. Exclude the Creator and there's no moral law by which man has to be accountable to. That's their worldview, and everything is filtered and accepted or rejected according to its predefined concepts. You would do well to read Dr. Jobe Martin's book The Evolution of a Creationist who as a teacher of Evolution later realized how set and unsupported an evolutionary worldview is. Where do you get your information about the "founders of Evolutionary View?" Darwin, who is credited of developing the Theory of Evolution by Natural Selection, did not come up with it to exclude a Creator. He did not publish his writings for a very long time because he was so torn and anguished what it meant for religious implications...he did not go seeking information to disprove or discredit a Creator...he was deathly afraid of doing so. He even admits in His own writings that he wishes he were wrong, but he could not ignore the evidence he collected. Again, you present misinformation to demonize the Theory and the scientists, I am hoping you did not just make it up and just repeating more propaganda that has been fed to you. You can accept Evolution and still have moral law. You can accept evolution and still believe that the Bible is the Word of God. I guess your problem is not with Evolution. It is that you believe that the English version of the Bible you read must be taken literally. We have a hard time understanding each other just typing in the same language here on this blog, and yet you think you can take a Scripture that has been translated at least 2-3 times before it got to you in English and you are going to take that as a literal factual account of specific things in nature? And then tell me that if I do not take a literal interpretation of Genesis that I am an atheist and have no moral law? Really? All of our Moral Law comes from Genesis? I am not sure how you can say exploring nature is exactly your point? Could it be you are not getting the right message out of the Scriptures? Is it possible at all that some Men may misinterpret the Word of God? Maybe the message in Genesis is supposed to be that God is the Creator, not a message of an step by step recipe for how He created. Is that possible? I read Dr. Jobe Martin's book. He took some biology classes in high school and dental school and taught at the Dentistry school in Baylor in the 1970s. This hardly makes him an "Evolution Teacher" or an expert in evolution. Another example of how you misrepresent information and mislead people about the facts. Just because you can spew out some scientific vocabulary and poke at holes that have not been worked out yet, does not mean you can simply ignore the loads of evidence that support the Theory. His arguments are non-convincing and not grounded in very good logic, science or theology. I have read books and watched videos on your site and on your worldview of a literal interpretation of Genesis and engaged in discussions with people who share you view. I am open to it and listen. Have you done the same with science and Evolution? Or do you only engage and surround yourself with people and books/movies that support your own worldview? I do not know why I have tried to continue this discussion, I guess it is fun. But it is disappointing that people who call themselves Christian can be so closed-minded and hostile to those who don't agree with them...even to the point of calling them immoral. I find your lack of humility disappointing. Again, you don't have to be anti-Evolution to love God, believe in Him, and hear His Word. You don't believe in Evolution simply because you think it goes against Scripture. Plain and simple. It has nothing to do with the evidence for or against it or what the Theory says scientifically. So just leave it at that. Don't go making up stories or data or preaching that Evolution says there is no Creator...at best, in your case, Evolution says the Creator did it a different way than the way you understand He did it based on your interpretation of the Bible. Todd, climb down off your high horse for a minute and listen to reason. You make the supposition right off the bat that everyone here but you hasn't read a lick of evolutionary teaching. I have for many decades, and was a Space Science major back in college before switching to theology. I found Evolution a weak and unsubstantiated theory that continues to have no viable evidence (which you've still yet to present). You must not hang out with other Evolutionists. They are ardent God-haters, and not God disbelievers. If you can't take the Bible literally, then you have to set yourself up as the authority of what to or not to believe. That makes you the ultimate judge of right or wrong? Ahem... God. You probably don't, but do you see where this type of thinking has placed you? IE - you're the god of your own making. Now, follow through on your accusations and now spend the years I have studying the validity of the Bible as the inerrant Word of God. This blog is filled with articles on the inerrancy of the Bible. Then tell me something's been lost in in the translation. You can't. And, that's because it'll change your worldview. I am not on any high horse, and I will listen to reason. I am asking questions that you seem to avoid. I am no expert in Space Science, but I would bet it is not heavy on studying Evolutionary Theory. But that is besides the point. I am basing my assesment of your understanding by the words you have used on this blog. You have yet to show you understand it, or what a Theory is in science or that Evolution is not a Theory of creation or has anything to do with the exsitence or nonexsistence of God. I have offered evidence. You have ignored it. Go back and read my posts. I have many friends who accept Evolutionary Theory and are believers in a Creator. You just slighted the majority of Catholics and Jews in the world and called them God Haters...not a great thing for a "Christian Minister" to say...I also know many Baptists, Methodists, etc who accept Evolution...not sure where you get this propaganda from. Todd said "Evolution cannot be labeled "Good" or "Bad." I call evolution bad. Evolution is the survival of the fittest. Kill the weak so the strong survive. Death and killing. These are evolution. If you deny this Todd you are being dishonest. Adolf Hitler would call evolution good. He murdered the Jews and mentally challenged in the name of survival of the fittest. Kill the weak so the strong may survive. So you are wrong. Evolution can be labeled as good or bad. I say bad, Hitler said good. BUT Creation is called GOOD by God!!! THE CREATOR CALLS CREATION GOOD!!! NO ONE can call Creation bad! I believe in the good creation of life and a perfected Earth. You can believe in your "neutral" evolution of killing and death. The God of the Old Testament used a lot of killing and death. Try to explain the Passover...or many of the other Biblical stories. Also if God created everything as is why would he give animals traits that are designed to kill other organisms? Did they acquire these after the fall of man? Is there a scripture that says this literally? Death and killing occurs in this world. That is not evolution's fault. Evolution describes what happens as a result of who survives and reproduces. Again, you show your misunderstanding. One point that I explain in my book, From Darwin to Hitler: Evolutionary Ethics, Eugenics, and Racism in Germany, aroused considerable controversy, and it flamed up even more after Ben Stein interviewed me for the documentary, Expelled: No Intelligence Allowed, which promoted Intelligent Design. This controversy swirled over the claim that Hitler and the Nazis were influenced profoundly by Darwinism. When I first began investigating the impact of Darwinism on ethics, morality, and social thought in late nineteenth-century Germany, Hitler and Nazism were not even on my radar screen. However, as I began discovering the connections between Darwinism and eugenics, euthanasia, and racial extermination, I couldn’t help but notice how many ideas being promoted in the name of evolutionary ethics seemed remarkably similar to Nazi ideology. The Nazis, after all, had implemented the most radical program of coerced sterilization in the world in order to try to improve human heredity. After World War II began, they began killing the disabled by the thousands. I began studying Hitler’s ideology in depth to find out how important Darwinism was in his worldview. Many historians had already remarked on the importance of social Darwinism in Hitler’s ideology. However, few had explored this from the angle of evolutionary ethics. I discovered that even though Hitler never used the term evolutionary ethics, he did indeed base his morality on Darwinian evolution. When I wrote From Darwin to Hitler: Evolutionary Ethics, Eugenics, and Racism in Germany, only the final chapter explicates the role of Darwinism in Hitler’s worldview. This chapter provoked the greatest controversy, however, with some internet critics claiming that Hitler rejected Darwinism and was a creationist. Thus, I decided to follow it up with an entire book devoted to the role of evolution in Hitler’s worldview: Hitler’s Ethic: The Nazi Pursuit of Evolutionary Progress. Therein I demonstrate not only that Hitler believed in Darwinian evolution, including the evolution of humans, but I also showed in detail that evolutionary ethics was central to Hitler’s worldview. So you do not address or answer any of my questions or give your own thoughts or responses to me, but instead turn to the biased perspective of one individual who works for the Discovery Institute? He is in the minority in his views, and most historians completely disagree with his conclusions. It is also interesting that the funding of the book was provided by the Discovery Institute...hardly a neutral source as they outwardly promote anti-evolution. Whatever! You are now a waste of my time, Mr. Know It All. You are now just playing a game of baiting people. Well, you can play the game with yourself now as I will NOT indulge you any longer. Have fun talking to yourself. Todd, that you deny the literal interpretation of the Bible, as Yoda said, "And that is why you fail." Without the solid foundation of the Bible as your starting point for knowledge, you will be all off course in your worldview. And you are. Yes, I can easily rectify what Catholics are notorious for claiming are two Creation accounts, like billions of others through time who have easily understood the account and accepted it. But, then you just inferred you'd accuse me of hypocrisy either way, so why waste my time? You're not being intellectually honest about Evolution. Where are the transitional fossils? Where does the Geologic Column exist as a whole outside of a text book? Why if Evolution doesn't cover origins that it spends so much time focusing on origins and indoctrinating people in "millions of years" throughout the schools, museums and zoos? Todd, Man, you've been duped. You fell for the whole lie of Satan hook, line and sinker. To admit your wrong would be a total worldview change, and that'd take you out as the main authority. You're not going to do it, for at the heart of sin is pride. I'm sorry to say, but you're too prideful to accept God's authority. That a Creator who can create a universe is certainly capable of writing a book and preserving it through time. Now, to be honest, you either have to eject Evolution or eject Christianity. They cannot coexist. They are polar opposites. You will one day stand before God and make an account of your life (Rom. 14:12). I wouldn't want to be in your shoes when you tell Him you spent your life disbelieving Him. Wow! I can't believe you do not see the hypocrisy in your own statements! Because I don't share your literalist biblical worldview I am too full of pride? I am accused of being the Know it all authority yet you are the one who is judging me and accusing me of falling for Satan? I am too proud to admit that I am wrong? All I did was ask questions and you respond with personal attacks? I guess that is because you cannot or do not want to answer the difficult questions. I love God and try to model my life after Jesus and His teachings. I can never imagine judging or speculating that somebody else would be damned to Hell simply because they question me. I am being intellectually honest. Look up the hand fish, it is a living "transitional fossil," go look at all the fossils of whale ancestors, they show a beautiful transistion from land mammal to aquatic mammal, and explain how and why they are more related to us than fish. Go look at the fossils found in the Canadian Artcic that found beautiful transitional fossils of half-fish, half-amphibian...I could go on. It seems to me that you have lost your credibility by the lies and misinformation you have presented. You claim I have spent a whole lifetime disbelieving in God, which is an outright lie, and there is no way you could judge that about somebody you haven't even met. This is consistent with the misinformation you and Billy have continued to present. Honestly, you want me to be a God-hater and for Evolution to be incompatible with Christianity...so you try to tell everybody that, and are not interested in discussing the possibility that you could be wrong. I could be wrong, there may be a good argument for why I should reject all the evidence of Evolution and believe that I cannot accept it and still worship a Creator. However, personal attacks, references to Satan and Hitler and providing deceptive information claiming all evolutionists are God-haters are unconvincing. Todd, nobody's attacking you. Ad hominem attacks are the Evolutionist's last and most desperate debate tactic. We are disagreeing, and that is all. What I am "attacking" is your worldview, because it is based not on God's Word but on the suppositions of man. With no solid biblical foundation, your view of God and reality are tossed to and fro based on the latest scientific discovery, which usually gets retracted when something else new is discovered. How can you model your life on Jesus? After all, you believe the Bible is corrupted. Whose to say the life of Christ isn't just a fiction? Can believing in a fiction forgive one of their sins and get them into Heaven? Do you even believe there is a Heaven??? Can't you see how you've created a reality all of your own? Without the Bible as an infallible, tangible source of knowledge, people have to pick and choose what "facts" they want reality to look like. Postmodernism. By clicking under Labels both Apologetics and Creation all our articles are posted addressing your presupposition that the Bible is not inerrant and arguments for Evolution. A reminder, this is my blog. It's got over 1,000 articles defending the different topics you've brought up. This is my "home" so I don't need to do the defending. As a "guest", you are the one who has to defend your claims, which I'm still waiting to see. 1. My opinions are mine alone. 2. I am a guest here. I have no official connection to Lamb & Lion. 3. Nathan knowledge of the Word and Prophecy are far beyond mine. At no point did I say the Bible was corrupted. Do you secretly know me somehow? You seem to like to put words into my mouth and tell me what my worldview is...I said that I, like many other Christians, interpret the Word differently than you. There are arguments over scriptures even within your own community. "You will one day stand before God and make an account of your life (Rom. 14:12). I wouldn't want to be in your shoes when you tell Him you spent your life disbelieving Him." "You probably don't, but do you see where this type of thinking has placed you? IE - you're the god of your own making." "You must not hang out with other Evolutionists. They are ardent God-haters, and not God disbelievers." "You're not going to do it, for at the heart of sin is pride. I'm sorry to say, but you're too prideful to accept God's authority." There were more but I think I made my point. You did say something that finally showed you understood something about science...it is open to new data and reexamine conclusions and explanations. It is open to admitting it was wrong and is constantly being refined and corrected. Something you are not open too. You assume that you have the authority to say how scripture should be read and interpreted. That you are the authority to understand God's meaning and Word. You are not open to the fact that you may be wrong or misunderstood God's Word. You also reject the possibility that God could be revealing Himself to you right now through me or others around you. You accuse me of the exact qualities you are guilty of. I guess I shouldn't have been surprised that you would attack me, leave the evidence online of it, and then tell me you didn't attack me. At least you are consistent in your arguments and acceptance of evidence. If it doesn't support your view, then claim it doesn't exist. Again, I gave arguments, listed facts and asked you to go look at the evidence. You chose to ignore it and avoid my questions. I tried to do this civilly with an open heart and mind, yet all you seemed to use was name-calling and attacks. At no point did you even entertain the possibility that my view could be valid, or honestly try to discuss it. I hope one day your resistance and hatred of people with different world views does not lead to violence like it has with other intolerant religious extremist in the past. I hope one day Christ opens your heart and mind. It's because I believe you to be far superior in knowledge of the Bible and Prophecy to me that I wouldn't want any of my lesser comments to shine a bad light on your more thoughful ones. I think you know what I meant based on the "wink". Todd said "I hope one day your resistance and hatred of people with different world views does not lead to violence like it has with other intolerant religious extremist in the past." This from a guy who praises the koran! Billy, you should try less hate and judgement and more education. And actually read the words of others rather than making up the commentary on your own. Now I praise the koran? First Hitler and now this? Because I suggested there may be useful Truth or information in there (some of it is the same that is in your Bible), I now praise it? LOL!!!!!! I am out. You people make up ridiculous claims and attack anyone and anything that suggests you may be mistaken in your opinions or understanding. I am out. Thank you for telling me who I am, who I praise, that I am living in an alternate reality, that I am full of sinful pride and that I don't believe in God. I am not sure, but somehow I don't think this ministry will win many hearts and souls over for Christ. I did find something interesting about one of the leaders of this ministry, and it comes from a Christian ministry very similar in belief to your own...kind of makes my point about who do you go to for authority and how you read and interpret the Bible...Apparently, not all Literalist Christians even agree with what your Ministry says about Scripture. I find their reference to Ephesians 5:11 in regard to Dr. Reagan's teachings and interpretations interesting. And with that I am done. Its been fun but frustrating and I truly do hope Jesus is with you and speaks to you. I will leave you in peace and post on your site no longer. Todd said "I am out." I pray you someday believe the truth. Todd, you sound like a martyr, but then that's another widely used debate tactic. I have absolutely not qualms with saying I absolutely and 100% believe the Bible is God's inerrant word by which we can know truth and salvation. I've made it my life's pursuit academically to be sure of its validity and am firmly convinced by all the evidence. To believe in anything absolutely these days seems to be considered evil, which is so postmodern. And yet, a stop sign is red. It's not blue, or green, even if someone wants to claim it is those colors. And yet, that's what postmodernism does. It says that whatever anyone says has equal bearing and that there is no absolute truth. Red, blue, green, well they're all correct. Now, when there is no absolute truth and everyone's opinions are equally valid, then who becomes the ultimate authority? Is it God? No, the Bible's discounted as false. Instead it is the person who has the opinion. Wasn't the lie of Satan in Genesis 3:5 "you will be like God, knowing good and evil"? Todd, it's not me who condemns your worldview, but the Bible. But then, that's why you need to discount its authority. It's not me who stands in "judgment" of your worldview, but the Bible. So, take it up with God. Nobody here's trying to shoot you down, but rather trying our best to show you what the Bible says is your error in thinking, and help you free yourself from humanistic teachings that will drag your soul down. We prayed for your in our daily devo today and will continue. Evolution (Darwinian) is a Platonic line of thought traceable back to around 700bc (see Henry Fairfield Osborne). It is the pagan concept of "continuity of being" consistent with Confucianism, Buddhism, Shintoism and Hinduism. The strongest supporter of Darwin's writings was the church, as it finally gave the accomodationists a chance to say "see, I told ya". But that doesn't make it true. "DNA is not evidence of God." Out in the southwestern desert, there are a collection of radio telescopes pointed out into space looking (listening) for evidence of extraterrestrial life in the form of "patterns in the chaos". Please explain how any logical mind would see intelligence from a telescopic pattern but not a microscopic one. "Fossils are evidence of evolution." Actually, fossils are more evidence of a global catastrophic flood. This would resolve the explanation of marine fossils found high up in mountain ranges such as the Himalayas. Also, fossils are mostly found in sedimentary rock, which is indicative of the past existence of large amounts of water. "Christians have a distrust in science." No, Christians (and true scientists) recognize the difference between true science and speculation, conjecture and extrapolation. Man's finite knowledge is limited to direct human experience, which is an average lifetime of about 70 years. Outside of that, we have recorded history, and we also have instrumentation that expands the limits of our experience (telescope, microscope, time-lapse and high-speed photography). We have no way of seeing into the future, and visions of the past prior to human experience is 100% speculation and conjecture. We can use our direct experience to speculate and form conjectures of what "might have been or might be" based on extrapolations, but when we have about 5 thousand years of data, and we say we can determine 5 billion years truth, that sounds like a million-fold extrapolation to me. We are called to have childlike faith in Him, not a childish faith in the sinful, rebellious thoughts of man. Throughout the centuries, ever since the fall, men have been rewriting creation to be without God, and the only way to do this is by so-called "natural law". Who wrote that law? That last verse should be a wake-up call. God created all things in 6 days, then rested. Man has been on this earth for about 6000 years now, and our time is just about up. For all you Todd's out there who believe Evolution is proven Science and not merely unsubstantiated and unscientific faith, watch this excellent video of interviews with Evolutionist scientists and students. As a Christian I disagree with Todd's views on evolution. However, the manner in which he has answered Nathan's attacks on his worldview suggest that his belief in Jesus Christ is not in question. John F.